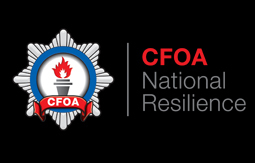 CFOA National Resilience Ltd (CNR) is a wholly owned subsidiary of the Chief Fire Officers’ Association (CFOA). The company is responsible for delivering a range of fire sector and national resilience projects for both Government and private clients. One of our principal work streams is to provide assurance to the UK Government that the following National Resilience ‘capabilities’ (i.e. specialised vehicles, equipment and trained personnel) are ready to deploy at times of national emergency. This is achieved with the collaboration of the major critical service provider, Babcock International. • UK ISAR (International Search & Rescue): CNR is funded to co-ordinate and manage equipment and training in order to maintain readiness and 24/7 deployment capability in response to sudden-onset disasters overseas; our most recent deployment was to earthquake-hit Nepal. We also work within the European Union Civil Protection Mechanism. The Chief Fire Officers’ Association of the UK assists a number of UK Government departments with the production of Policy that passes through Westminster. As its trading arm, CNR Ltd is able to draw upon this experience in order to assist our clients. • Asset procurement and management.